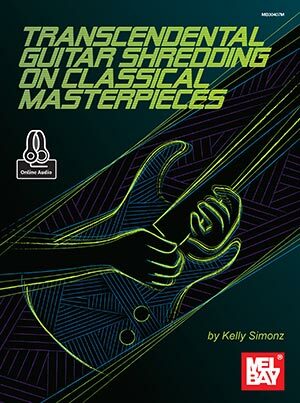 Transcendental Guitar Shredding on Classical Masterpieces by Kelly Simonz is a comprehensive approach to shred guitar drawn from classical music techniques and repertoire. Surrounded by a rich classical music tradition in Japan, Simonz has combined his love of classical music and the electric guitar, presented in this virtuosic technique method. The material covers warm-up and cool-down phrases, sweep and economy picking, vibrato, muting, dynamics control and much more. The concepts are applied through the extensive repertoire, which includes pieces by Mozart, Brahms, Wagner, Bach, Beethoven and other well-known composers. Exercises are written in standard notation and tablature and include access to online audio.